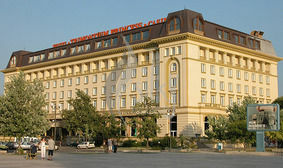 The Congress Centre of Hotel Trimontium Princess Hotel in Plovdiv is situated conveniently on the Panoramic floor, adjacent to the hotel's Panorama bar and restaurant Ambassador. The spaciousness and the layout of its Conference Halls combine well with their versatility of use. They are equally preferred for private meetings, business meetings, seminars, conventions, products launches, sample presentations etc.